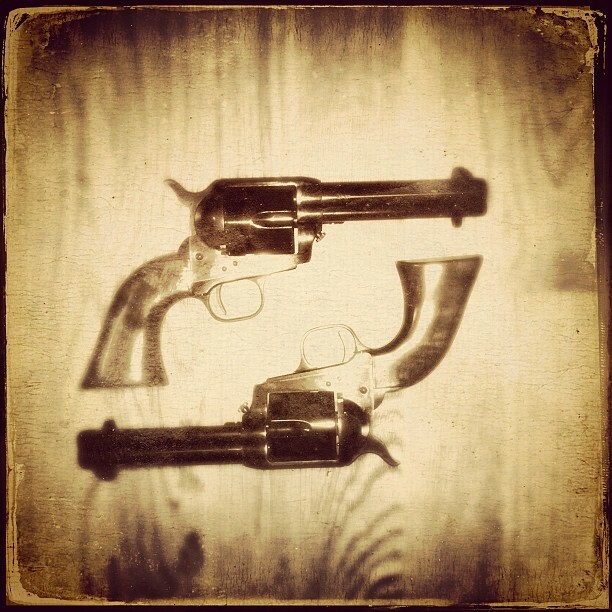 These are my Uberti Cattleman revolvers. I use them for CAS. Lee’s shooting irons are important to her for several reasons. Being a woman, she doesn’t possess the brute force of the men she’s commanding, or the villains she’s facing. Being able to wield her weapons quicker and more accurately than those she’s up against, and the men who follow her lead, is paramount to her success in claiming respect, causing fear and staying alive. She usually carries four revolvers. It makes her a dangerous adversary, who doesn’t have to cower and hide when she’s emptied one gun. Beside the practical aspect of this, I like the aesthetic of four guns on her person; it prompts an intimidating figure. There are certainly additional elements to Lee’s character that makes her stay in charge, but I’m gonna aim to stay on target here – we’re talking about shooting irons, after all. It was important to me to show the reader that Lee is an authority on shooting irons. I did research, asked for assistance and learned to shoot, in order to transfer the knowledge and know-how I figured the protagonist of my series needed, to be representable as a know-it-all gunslinger. In short: I had to become an authority on shooting irons myself to make Lee one. In the first draft of Embers at Dawn I had equipped Lee with two Colt Peacemakers. This was about three years ago, before I had much of a grasp on weapons. A friend of mine got me in touch with an avid CAS (Cowboy Action Shooting) practitioner, who possess a vast knowledge of firearms of the Old West. The Peacemakers were subsequently replaced with something more interesting upon his advice: A pair of Remingtons and Merwin & Hulberts. Lee’s Whitworth rifle was integrated in the story from the first draft – and remained in the story with the gun-savvy Cowboy’s blessing. I believe that the weapons a character carries, and how she wields them, can say a great deal about her personality. The making of the piece and the condition it’s in might suggest a preference regarding practical concerns or a sense of style. It may also emphasize a character’s history, social status or indicate a certain profession. In time, I will dedicate a post to each shooting iron from The 9 Lives of the Outlaw known as Crazy Cat series. This entry was tagged "9 lives", "embers at dawn", "old west", book, Crazy Cat, female protagonist, guns, gunslinger, JC Loen, novel, outlaw, research, revolver, series, shooting irons, the 9 lives of the outlaw known as crazy cat, weapon, western. Bookmark the permalink.